I'm such a big fan of these corner bookmarks by Beate Johns (here's the link to the tutorial), they slip simply over the corner of your book to mark your spot. I gave the last one I made to my mum but I really wanted one for myself so I made another!! You need so little to make them and you can make them as fancy or as simple as you want! I went for the fancy option!! 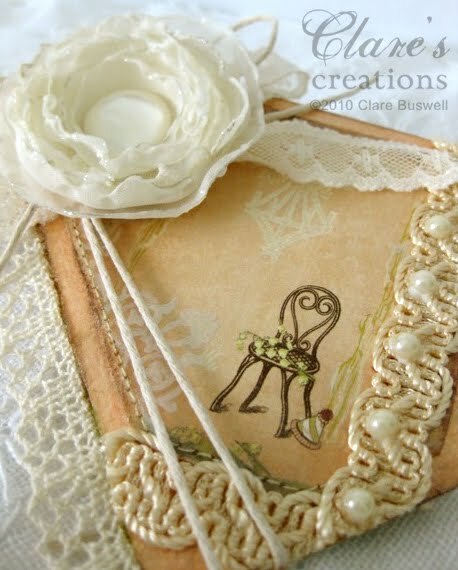 I also made this with the Moxie Fab World Card Style Week Shabby and Vintage Challenge in mind. 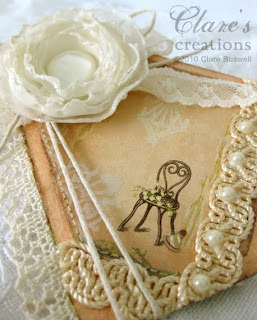 I just love this little chair image, it's one of my favorites from Webster's Pages petite papers Garden Gala pack. The petite papers are just perfect for cards and these bookmarks, the images are just the right size!! So I went with a nice peaches and cream color scheme to pick up the colors in the paper. The trim is an old trim I had in my stash. I added the flat backed pearls. I distressed the edges with some Creative Inspiration Paints in Mango, Caramel and Chocolate. I don't know if you can see it but I did stamp a little motif from Victorian Fripperie by Waltzingmouse Stamps and embossed in silver pearl. I stitched around the edges of the bookmark on the sewing machine. The flower I made from circles of cream organza fabric and cream lining fabric. They're really easy to make (a little dangerous, make sure there's no kids around! ), the edges of the fabric circles are heated next to the flame of a candle so the edges melt. The fabric never touches the flame, always about 1cm from the edge of the flame. It only works on synthetic fabrics. It's an amazing process, the edges curl up just like petals!! Then you just layer the circles and add a centre. I brushed the edges of mine with some PVA and dipped into some ultra fine glitter!! So, there you have it, the corner bookmark. I'm definitely addicted anyway!! Give it a try, it's really easy!! Other: Ribbon from Prairie Bird Boutique and Memrie Mare at Etsy, lace from stash, natural twine, flat backed pearls, pearl button, organza fabric, cream lining fabric, trim, Creative Inspirations Paint in Mango, Caramel and Chocolate, Silver Pearl embossing powder, heat gun, ultra fine glitter. I just love it! !Its gorgeous.Thanks for the link Ifeel a new addiction comming up. Oh,Clare, how beautiful is this! I need one of these! Clare, this is the most gorgeous bookmark I've seen. Absolutely stunning. The prettiest bookmark I've ever seen! that is beautiful! That flower is so pretty! Just beautiful - perfect in every way. Have a wonderful holiday!